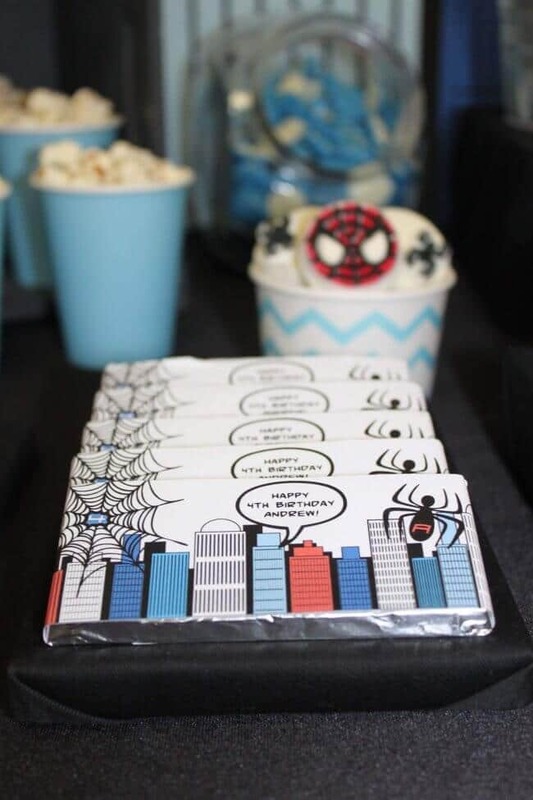 This Spiderman themed boy’s birthday party styled and photographed by Emnie Papaioannou, of Isabel’s Confetti, is amazing. 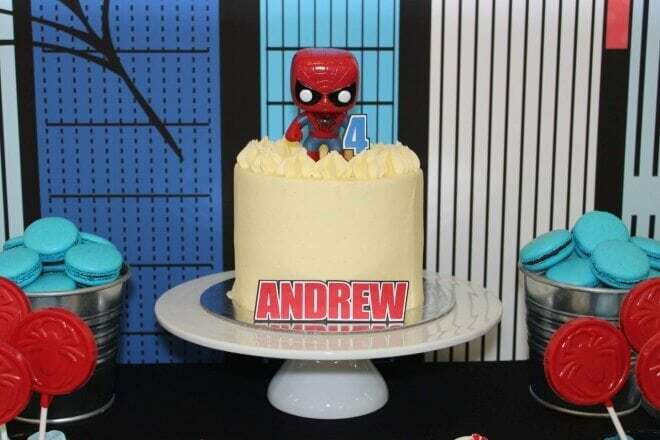 Inspired by her son’s love of Spiderman, it is full of Spiderman decoration ideas, a cool birthday cake and desserts, plus high energy games and activities. 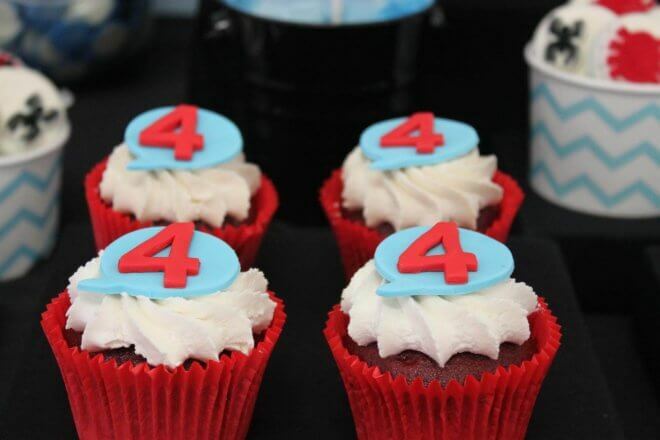 Your superhero-loving son will be amazed by this Boy’s Superhero Themed 5th Birthday Party. 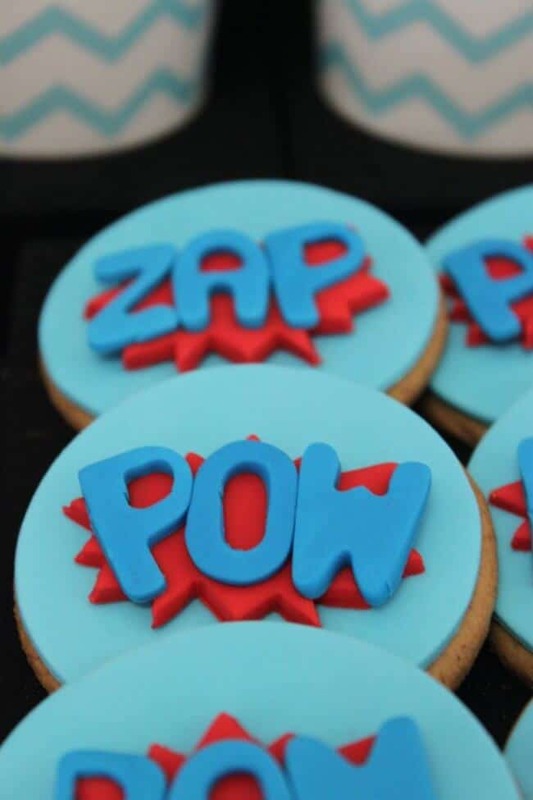 Don’t miss the colorful ideas in this Superhero Party Dessert Table! Emnie stayed true to the classic Spiderman. 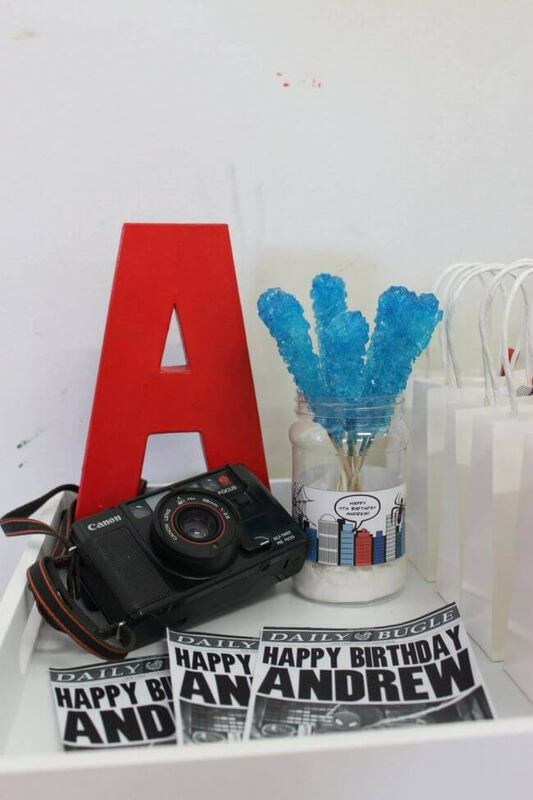 Her party centered on the traditional red, blue and black color palette with accents of yellow and white. 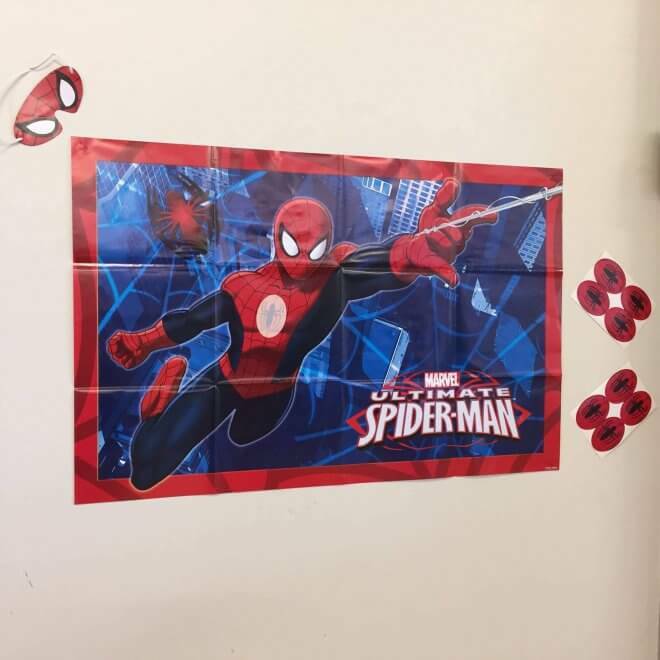 To set the stage for an awesome Spiderman themed event, Emnie initiated the super graphic design powers of dynamic duo Anders Ruff. 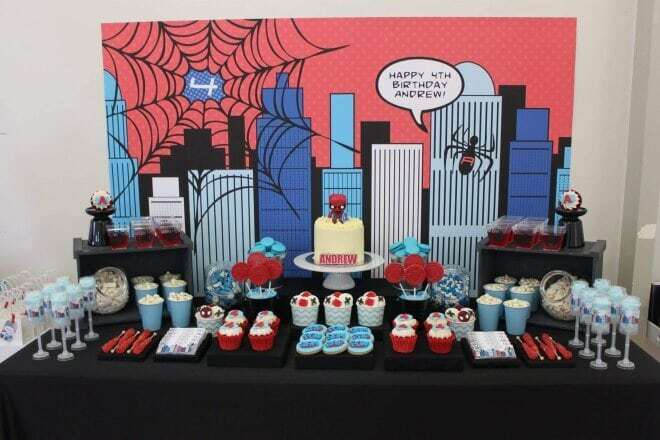 The incredible dessert table backdrop and coordinating printables really add a superhero vibe and definitely give emphasis to the theme. I have a feeling the overflowing dessert table may have stolen the show. 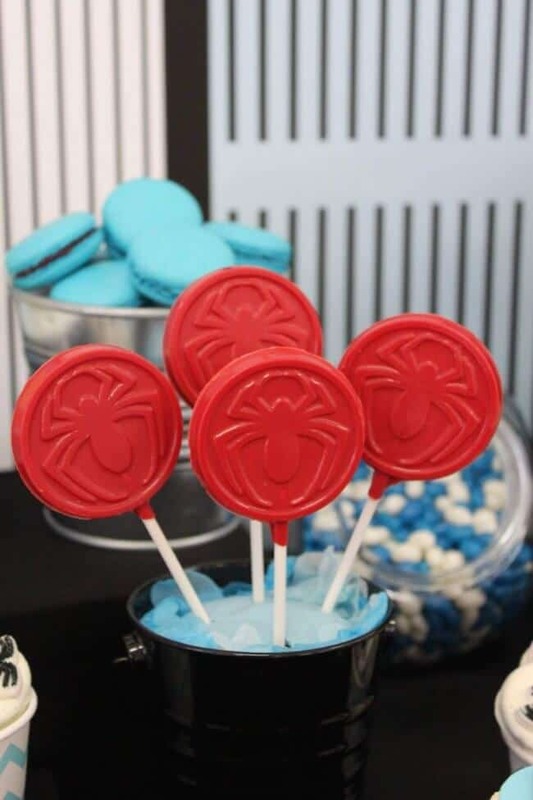 Guests got to choose from fondant-topped cupcakes, designer cookies, custom wrapped chocolate bars and spider suckers. 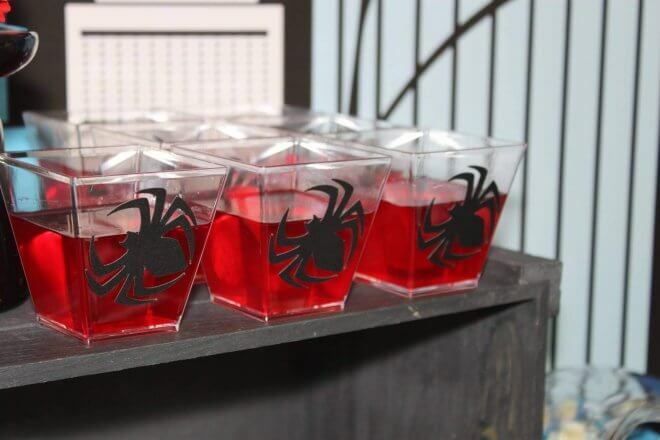 Jell-O cups with spider cutouts (Memories are Sweet), push pops full of cotton candy, cups of popcorn and a variety of candy delights were other menu offerings. If those desserts weren’t enough, a cake by Paper & Poppies also added to the display. I love that it was kept simple, affording Spiderman top billing. Emnie creatively displayed desserts to add height and interest. 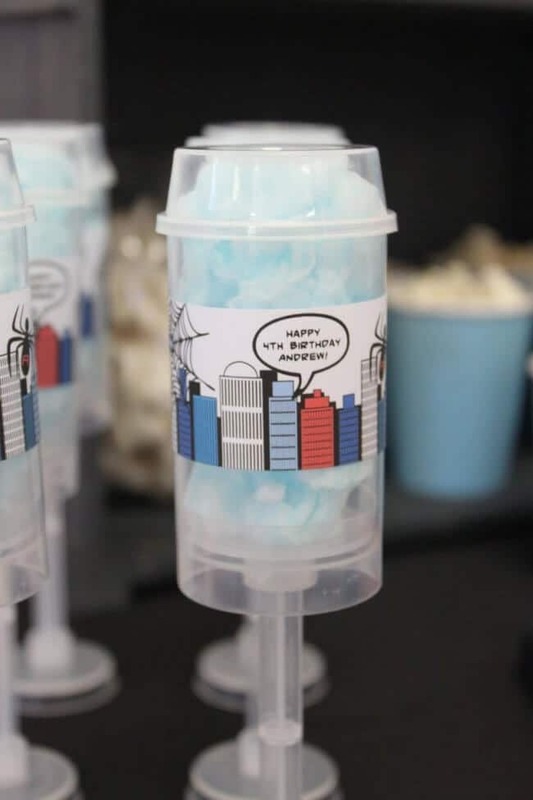 A variety of pails, candy jars and color- coordinating cups and pedestals made the desserts the stars of the table. Even superheroes get thirsty, or so a framed sign says at the fully stocked beverage station. 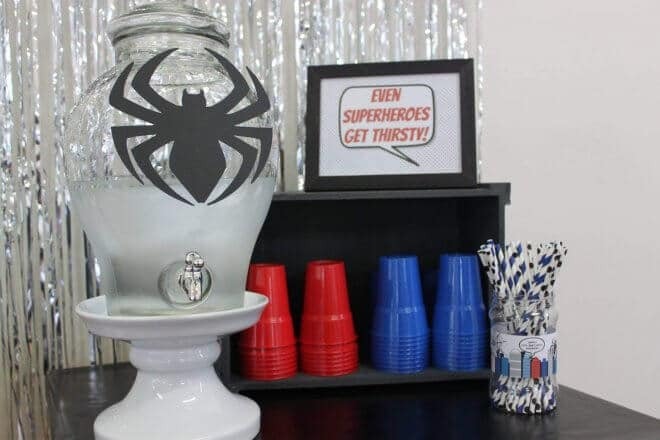 Colored cups, polka dotted straws and a spider embellished drink dispenser were on hand to curb the thirst. 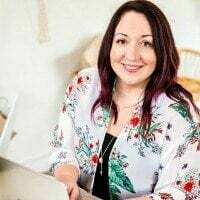 Guests at this party definitely dined in style! 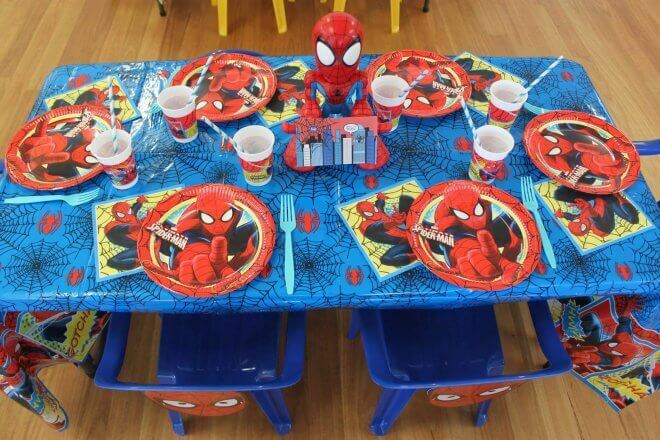 Tables were laden with Spiderman themed plates, cups, napkins, tablecloths and centerpieces. 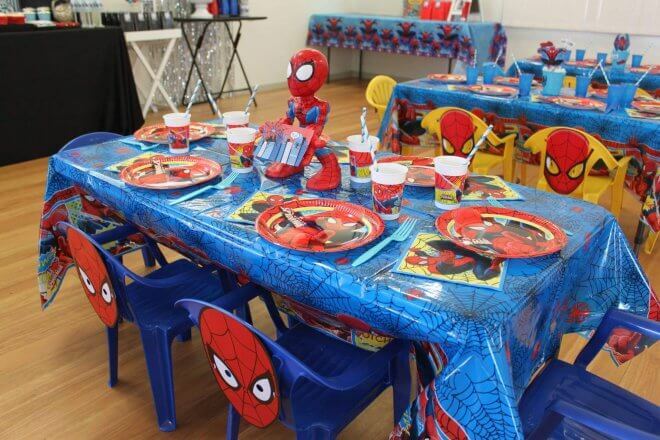 Because details make a party, I especially love the huge Spiderman faces that back each chair. What a fun dining atmosphere! 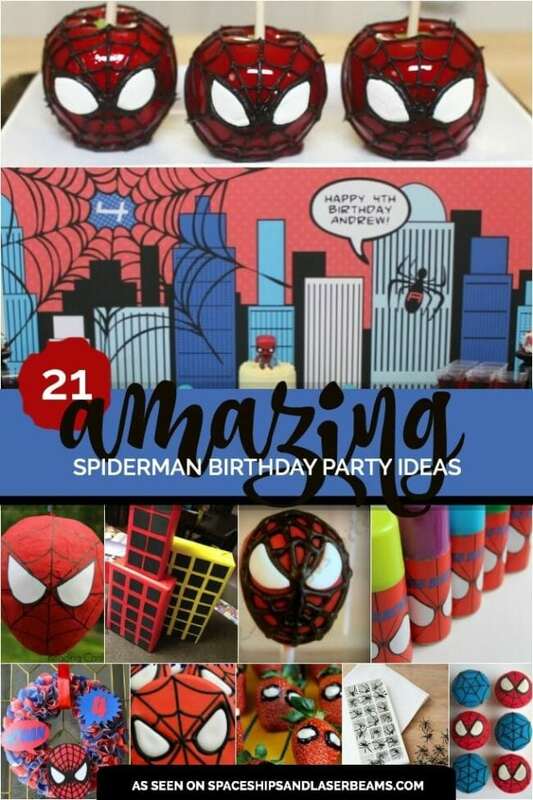 Clusters of metallic Spiderman themed balloons add life to the party space. 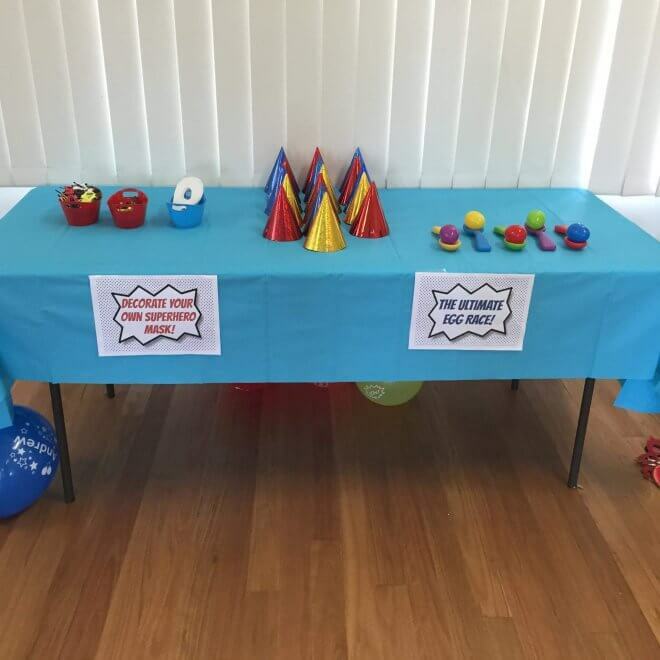 Balloons are a great way to anchor areas of a large party venue. To keep the party action-packed, guests created their own masks and participated in “the ultimate egg race”. Afterwards, they enjoyed a special appearance from Spiderman himself, which was a favorite highlight! There was also a Pin-the-Spider on Spiderman’s suit game. Classic games are always a hit. 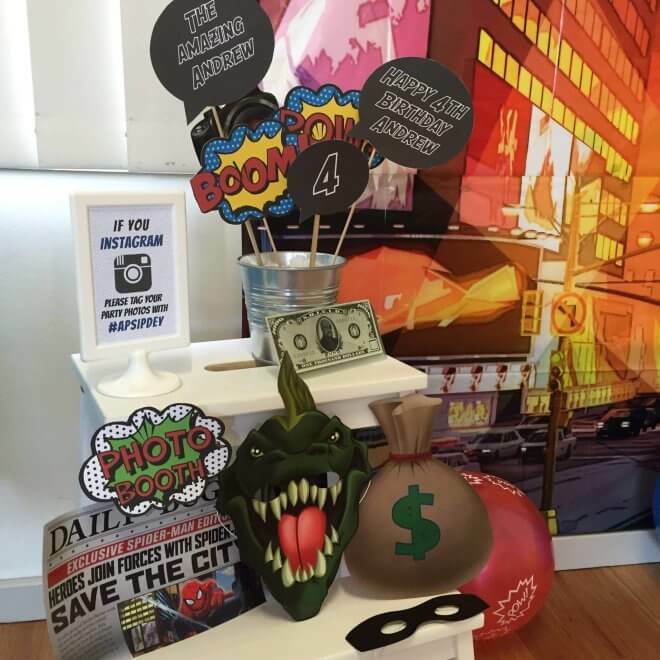 An awesome photo booth was set up where guests could pose for a picture. Great photo booth props from The Things Hannah Loves paired perfectly with goofy glasses and silly masks to make the experience especially fun. Like a regiment of standing at attention soldiers, favor bags look ready for inspection. 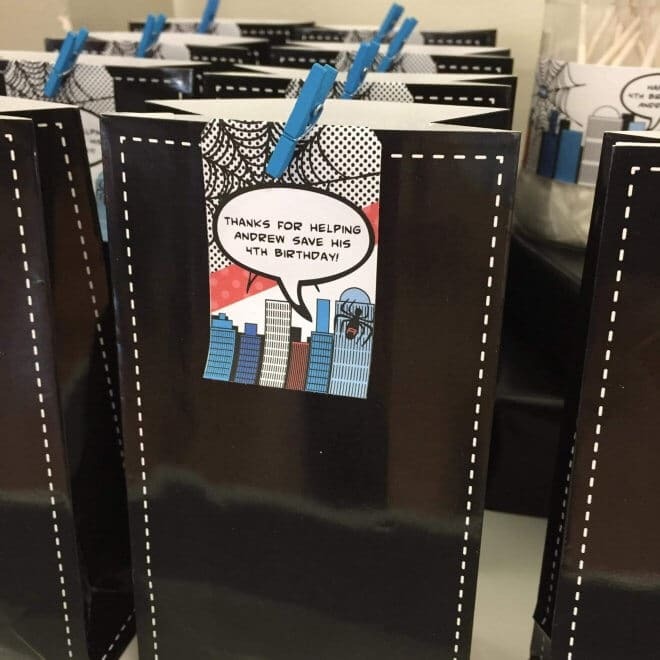 The custom printable favor tags thanking guests for helping Andrew save his 4th birthday add a special touch. 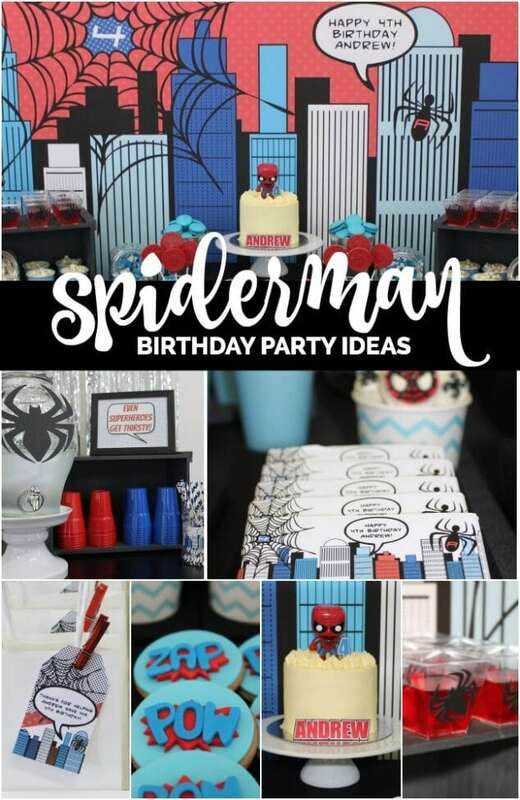 Including these birthday party suggestions with your own web of ideas will ensure one amazing Spiderman themed boy’s birthday party! 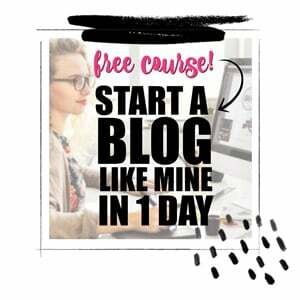 Don’t miss out on these superhero themed ideas here.